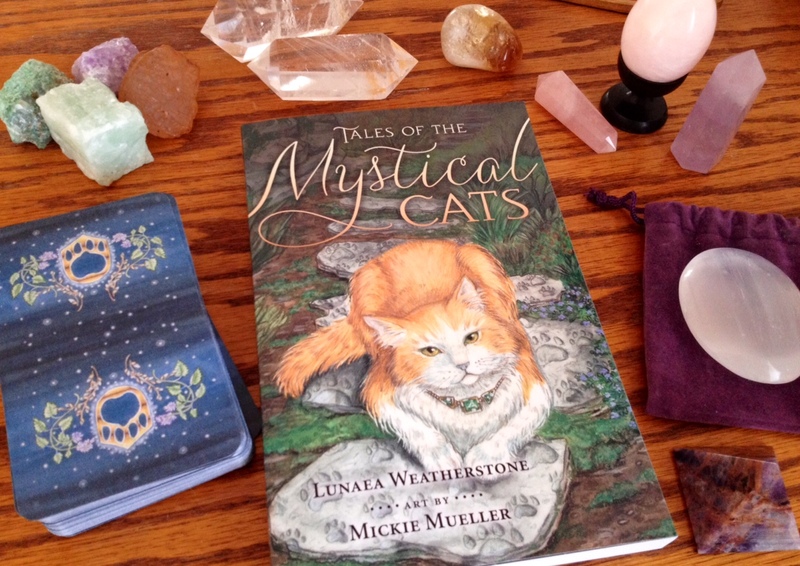 The Mystical Cats Tarot by Lunaea Weatherstone and illustrated by Mickie Mueller is my favorite feline tarot deck to date. Aeclectic, as usual, provides close-up image files of the cards. The art is soft, has a children’s book feel to it, and most importantly, is spot on in capturing the expressiveness of cats. All cat lovers are going to love this deck. Now one thing I did note right away is the crappiness of the box packaging. Sorry. This isn’t a box I want to keep, but also this isn’t exactly the kind of tarot deck I’d make my regular reading deck, which means such a deck is one where I’d normally keep the box, but this box is just awfully thought through. I’m assuming the cards are supposed to fit in that smaller space, but it doesn’t, and a few always slip down where the book is supposed to be. The only way this box works is if you have a tarot bag to commit to this deck. Then it’ll fit in that space without cards accidentally falling through the crevices. The deck doesn’t come with a little white booklet, but rather, a very nice 5.20″ x 8.00″ perfect bound book that I enjoyed reading cover to cover. There’s a ton of information in there, though nothing new for the seasoned tarot reader. Still, it’s definitely nice to have. Oh, and shouldn’t that title be Tails of the Mystical Cats instead of Tales? Kidding. The cover of the book features the Earth King card, featuring a kitty who looks just like my little Prince (there are always photos of him on my Twitter). The book consists of tarot basics, card meanings, suggested spreads, and–my favorite– an appendix of rough sketches from the artist during the brainstorming phase for the deck. The cards are 2.75″ x 4.60″ in dimension, borderless, with rounded corners, matte, but on somewhat flimsy cardstock. They’re very easy to shuffle, fit snugly in my hands, and are overall a very efficient deck to work with physically speaking. It’s not exactly a clone of any of the traditional tarot systems, but it’s also very easy to read for anyone with tarot reading background. The Minors are divided into four “cat clans” (love! ): the Fire Cats, Sea Cats, Sky Cats, and Earth Cats. The Fool is just The Cat. The Magician is Cat Magic. The Hanged Man is The Floating Cat. The Devil is Demon Cat. Judgment is Good Kitty. And there are other minor differences here and there, nothing difficult to follow. The courts? Kitten, Tom, Queen, and King! Awww! I love it! I love how they structured the book. “The Cat’s Advice.” In a deck review by Barbara Moore published in The Llewellyn Journal, it’s mentioned that Mueller, the artist, used “special herbal infusions in all her watercolors . . . based on [the herbs’] magical properties.” And all of the artwork for the card images incorporated catnip! 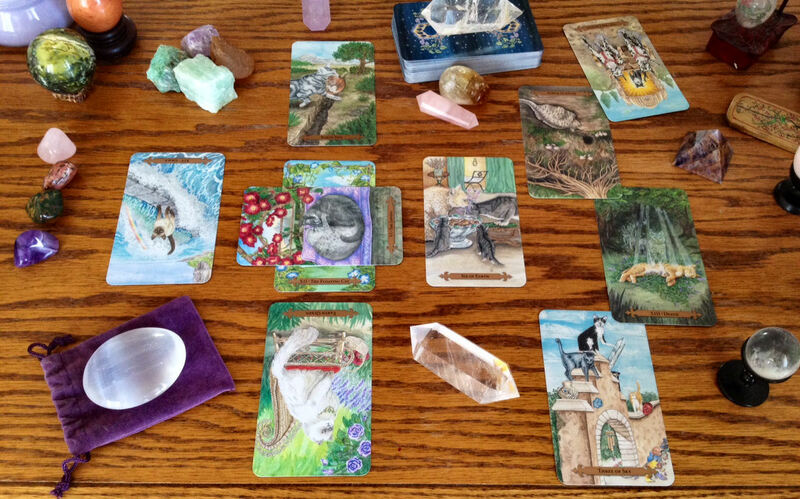 Above is a personal reading I did using the Mystical Cats Tarot. It’s the Celtic Cross, though yeah, the column of four cards is all crowded and clumped due to lack of table space. While I am not likely to pull out this deck for professional readings, I might be inclined to use it when I do fundraising events for animal shelters, animal non-profits, etc. How fun would that be! 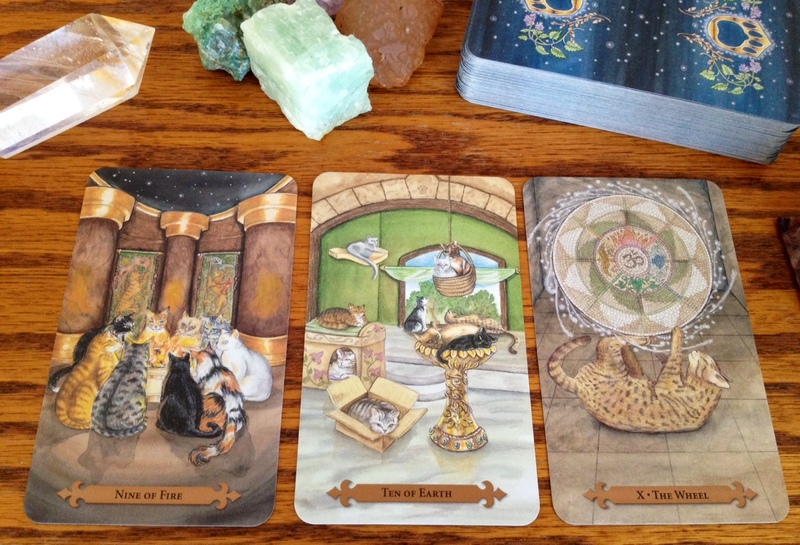 Overall, I adore this deck, but I also know I’m biased– I love cats. Now, of all the kitty-themed tarot decks out there to date, this one is by far the best. 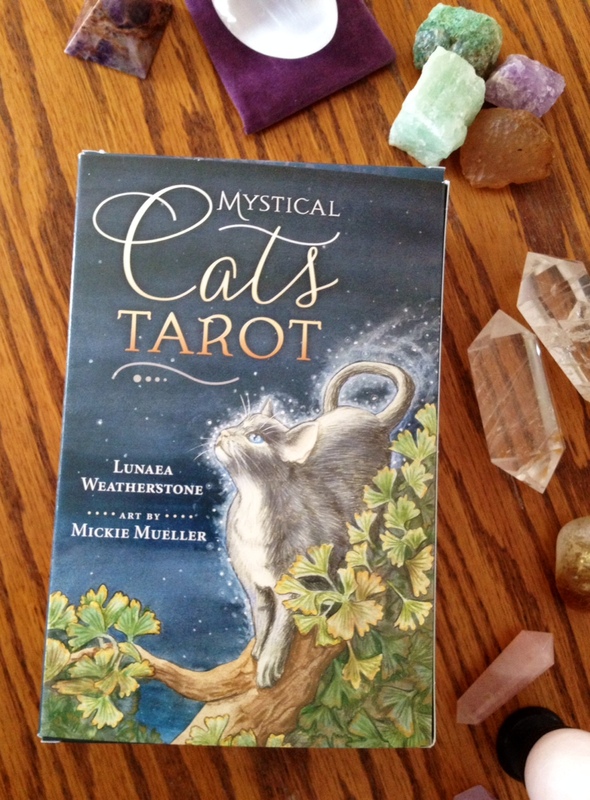 If you can only buy one kitty tarot deck, then Mystical Cats Tarot is the one to get. Oh! I’m a dunce. That’s good to know and helpful. Thank you so much! I know that Mickie Mueller, the artist, also has an etsy shop for Mystical Cats Tarot, and includes various items with the deck art on it — including tarot bags. I keep mine in one of the bags 🙂 Blessings! Bought the App after reading your review, Love it!! I finally succumbed after a year of having this on my wish list. It’s on backorder but I figure I’ve waited this long. Just wanted to tell you that I cut out the spine of the box and any other bits I can salvage, and use them as bookmarks. They work great because there is usually reinforcement of the layers in the box, so the bookmarks are sturdy without lamination. You can use one for the book that comes with the deck and if you cull others from the scrap heap, they can go into general bookmark piles to be used with odd paperbacks or library books. 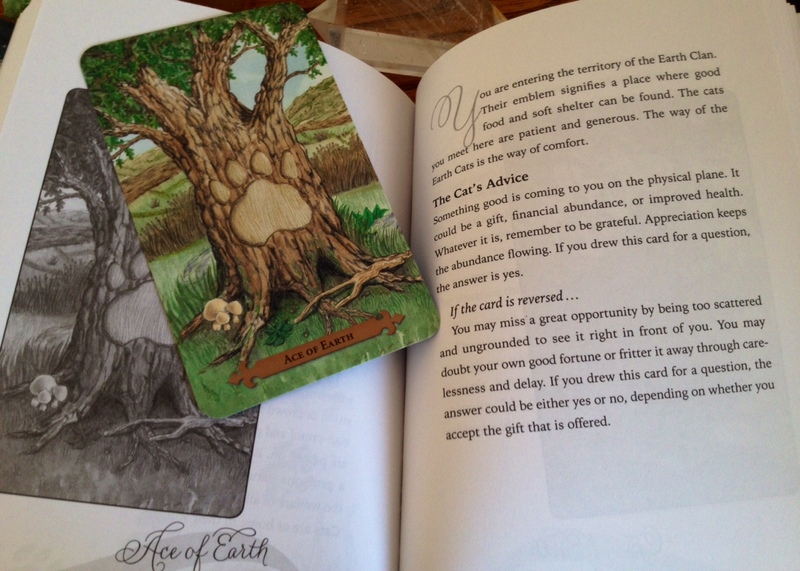 The graphics are usually terrific on tarot boxes, so I always hate to discard them without trying for a bookmark. Print an appropriately-sized pattern and trace it on the card box, cut it out, fold it, and you will have a custom box that fits the deck. The graphics don’t always end up in the right place but for small decks it works well and the cardboard is sturdier than regular card stock. »Plus, instead of slopping around the generic white Llewellyn box, your deck will fit nicely in its new box. 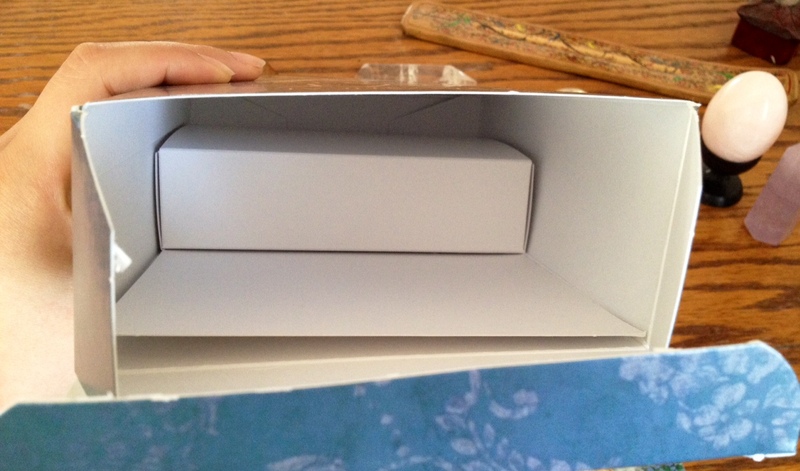 If the deck box isn’t big enough to cut out a tuckbox that folds at both ends, make a template for a glued bottom, then glue the bottom of the tuckbox. So, no more throwing out those boxes for you! This deck was a birthday present from my felines (ok, from me). I haven’t had a chance to really work with it, but I do love cats and have gone thru two Tarot of the Cat People decks. Blessed Be. This is so easy to read and with the good basic book. one does not need to know anything about tarot. esp. if one wants to be more intuitive reader. This was perfect beginners deck for me. 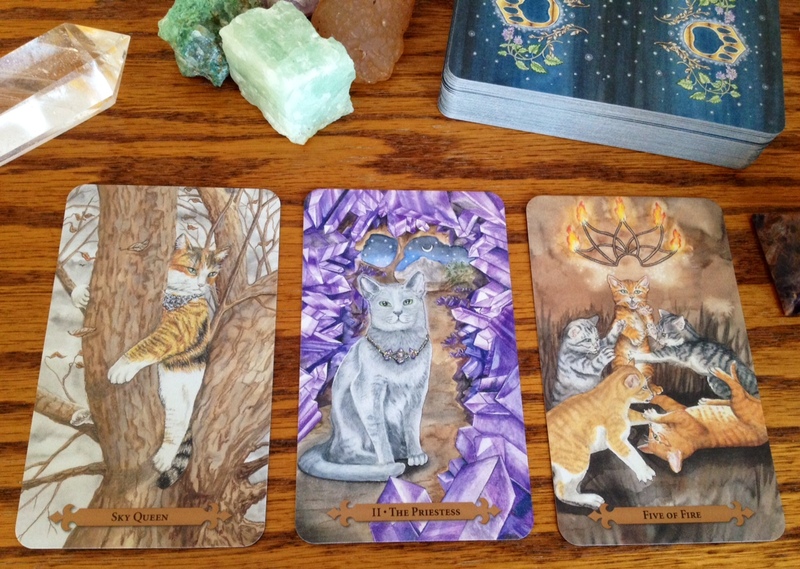 If you love cats, this is wonderful tarot deck. I had been attracted to tarot for a long time, but could not find a deck I could work with. This deck opened tarot wisdom up for me. I have moved on, but it remains a beloved member of my tarot tools.